Chicago: kill the black snake! 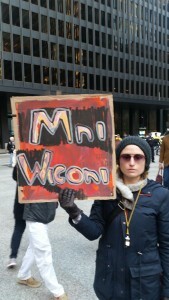 Chicago—On Nov. 4 hundreds gathered at the site of Occupy Chicago five years ago to march in solidarity with Native Americans and other protesters in North Dakota being brutalized and arrested by the hundreds while blocking the Dakota Access Pipeline. Even Cubs fans joined us after the slightly larger World Series celebration earlier in the day. A whole series of #NoDAPL actions have occurred in Chicago, each time in coordination with hundreds of actions across the world. On Sept. 13, 150 people gathered at the Kwagulth Indian Totem Pole in Lincoln Park. Native ceremonial elder Singing Man of the Southern Arapaho from Oklahoma stressed that the U.S. had violated every treaty it has reached with Native American peoples, but that this movement can win. That same day, dozens of people blocked streets in Toronto’s Financial District, and activists blocked construction of a natural gas pipeline near Hines, Vermont. By Nov. 12, more than a thousand gathered at Federal Plaza to voice rage at the continued lawless attacks on peaceful Standing Rock protesters including the firing of potentially lethal rubber bullets and filling jails like it was Birmingham, Ala., 1963. The crowd was swelled by some of the thousands marching daily in defiance of the Donald Trump presidency, claimed without even a plurality of the popular vote. 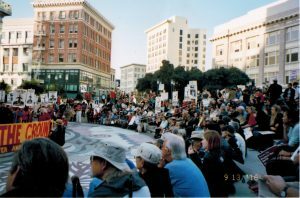 Rally speakers included Native American activists, a representative from Black Lives Matter, a young woman reading a moving poem and another with an equally moving chant to begin a Snake Dance to “Kill the Black Snake”—the pipeline violating Native land. Signs everywhere proclaimed “No DAPL” and “Water Is Life.” The protests that began as Obama and Hillary Clinton failed to oppose DAPL will continue under Trump, who has vowed to dig and drill. 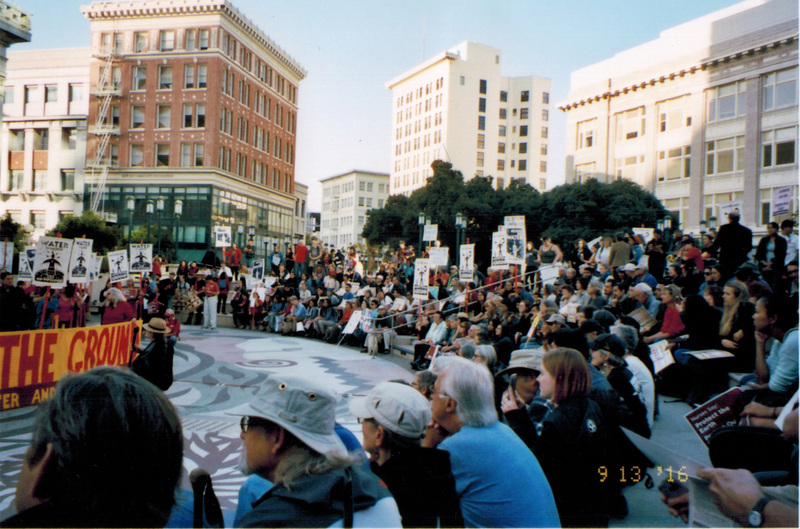 Sept. 13 rally in Oakland. Photo by D. Chêneville for News & Letters. 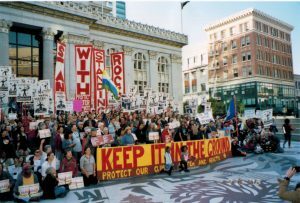 Oakland, Calif.—On Sept. 13, 400 people gathered at Frank Ogawa/Oscar Grant Plaza to voice their solidarity with the Standing Rock Lakota who are fighting to stop the Dakota Access Pipeline. It was uplifting to see such a dedicated crowd, and to be reminded that there is a large and committed American Indian community in the East Bay. The high point was in some of the ideas expressed there, and two in particular stand out. After a number of moving speeches, two Lakota women performed a traditional water ceremony based on the way we are all made largely of water, and are all part of nature. We share, whether we recognize it or not, that we are all of a common substance. This is an opposite view of nature and of human nature to that of capitalism, which tears apart that which is living and human. Another speaker told about what it means to be indigenous, and asked us to get in touch with the indigenous part of ourselves. Our sense of togetherness is not just subjective, but part of the actual world in which we live. Many people got to know each other. Connections and commitments were made, and people left with the hopes and aspirations of broadening and deepening this movement. 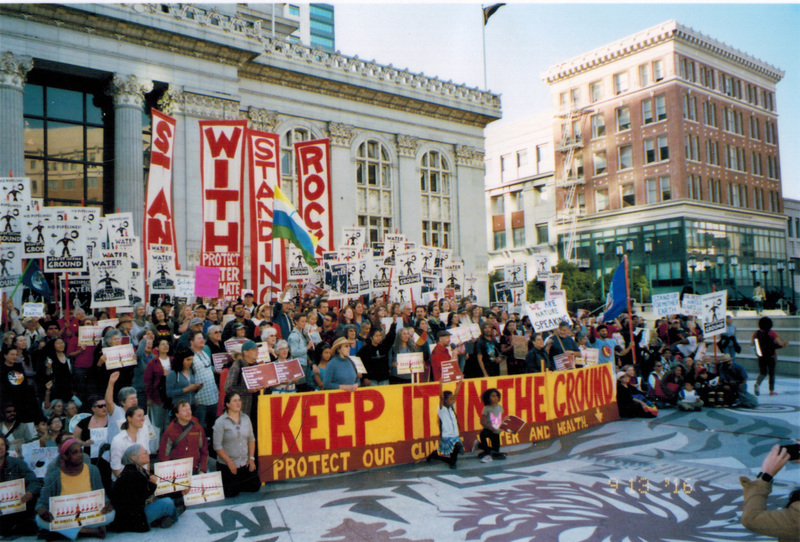 This entry was posted in Articles and tagged Barack Obama, Bob McGuire, Camp of the Sacred Stones, Cannon Ball North Dakota, Chicago, climate change, D. Cheneville, Dakota Access oil pipeline, Donald Trump, Energy Transfer Partners, environmental movement, fossil fuels, Franklin Dmitryev, Hillary Clinton, Illinois, Indigenous peoples, Kwagulth Indian Totem Pole, Lakota, Mizuho Bank, Native Americans, North Dakota, Oakland California, Occupy Chicago, Singing Man, Southern Arapaho, Standing Rock Sioux Tribe. Bookmark the permalink. ← Lead-Editorial: No to Trump’s counter-revolution! No to fascism! Fight for a new human society!